For a fun view of creative minds at work, I sometimes visit behance.net . There, anyone can post their creative work for others to see and comment on. It can help a person fine tune their ideas as well possibly lead to work coming from someone looking for the creative person’s talents. I was searching for vintage work when I came across several Polaroid themed projects. One, a magazine about the history of Polaroid and The Impossible Project linked off of behance.net to a service provider. The magazine/book appears to be a school project so it was never produced, but The Impossible Polaroid Book is a nice online read. 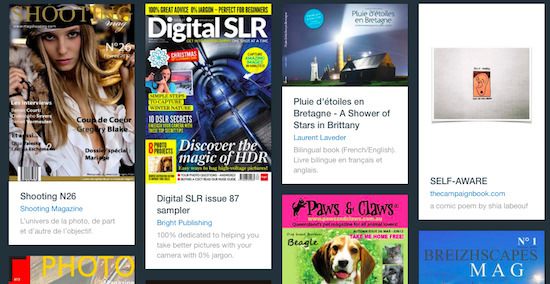 The magazine/book was being hosted on issuu (I didn’t get it till autocorrect tried to replace with ‘issue’). 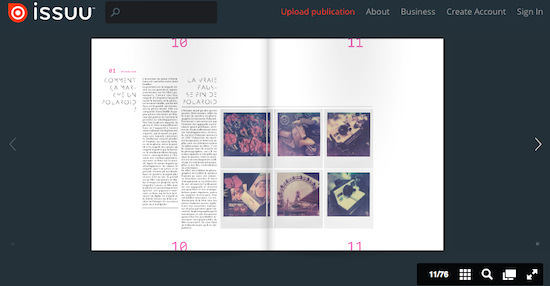 The service hosts small run online magazines as well as online versions of major printed publications. For someone looking to post their hard work, there is a free service of ‘Essential Features’. Beyond that, if site integration, targeted distribution, and other customizations are $29/$39 per month. What a great way to put together a magazine idea, promote, and see if there can be a following that could turn into a for-pay product. There doesn’t seem to be any limitations on the quantity of publications an account can have and no limits to the number of public views. What will it be? Tips on iPhone photography? Your favorite shots? Special edits you have done to photographs? Issuu appears to be one way to see if anyone shares in your interests.